2007 Reproduction, Retro Evening Formal Clothing Patterns - Misses dress and jacket. 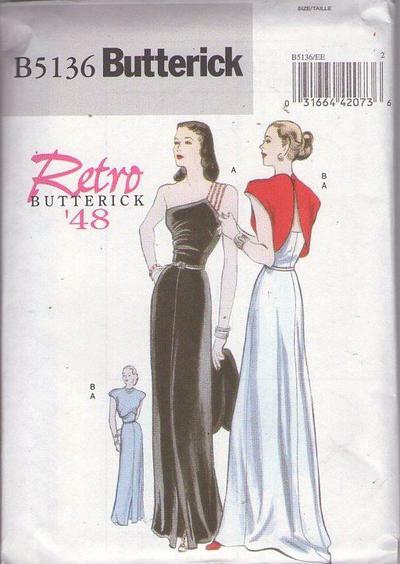 Close fitting, slightly flared dress has right side gathers on bodice, left shoulder straps with sequined trim, center front slit, back zipper and grosgrain waistline belt with purchased buckle. back extends approximately 8" beyond floor length. Loose fitting, above waist length, lined to edge jacket has raised neckline , front darts , back self fabric and covered raglan shoulder pads. GLORIOUS vintage styles!